Three Stanley Cup championships in 6 seasons. In the modern "salary cap era" of professional sports, that's achieving almost the impossible. But with their Stanley Cup win over Tampa Bay this season, the Chicago Blackhawks have cemented themselves as a dynasty. Keeping a championship team together is extremely difficult due to the salary cap. But the Blackhawks front office deserves a whole lot of credit for being able to achieve what this franchise had. They've made the hard decisions on when to let players go, players who were major contributors to championship runs. They didn't trade away future prospects or high draft picks at the trade deadlines to pick up rental players. And most importantly, they drafted well and trusted the players they drafted, allowing them to grow into contributing roles. With the salary cap in place, building a solid team through the draft is the most important piece to creating a championship caliber team. The Blackhawks faced this after winning their first title in 2010. Dustin Bfyuglien, Kris Versteeg, and Andrew Ladd, who all played a vital part of the teams championship run, had to be traded to get under the salary cap. Starting goaltender Antti Niemi, was lost when he filed for arbitration and the team couldn't sign him because they were up against the cap wall. The following season, Brian Campbell, Troy Brouwer, and Tomas Kopecky were traded to keep the team cap compliant. Chicago was eliminated in the first round of the playoffs in both 2011 and 2012. Like this article? You should check out all our Target promo codes! But instead of panicking and overpaying or signing higher priced free agents to high salary/long term contracts, the Blackhawks perservered by sticking to building their team through the draft. Brandon Saad, Marcus Kruger, and Andrew Shaw all emerged as the Hawks returned to the Stanley Cup in 2013. And the core that GM Stan Bowman had built through the draft, Jonathan Toews, Patrick Kane, and Duncan Keith became superstars. Corey Crawford developed into a tested starting goaltender. And Chicago won the Stanley Cup again. Stan Bowman and Owner Rocky Wirtz have built the model NHL franchise. They've kept their core together. They've added key free agents such as Marian Hossa and Patrick Sharp to compliment Kane and Toews. They trusted the guys they drafted, which led to Brent Seabrook and Niklas Hjalmarsson becoming top line defensemen. And they continued o draft strong, as Teuvo Teravainen, who was a major contributor to this years Stanley Cup team, was selected in the 1st round of the NHL draft. And the Blackhawks have dominated off the ice as well. Nielson research showed that 50% of the Chicago market had either watched, listened to, or attended a Blackhawks game in 2013. The Blackhawks had 3,400 season ticket holders in 2007. They now have a waiting list of over 13,000. They've appeared in the most nationally televised games of any NHL team. And in Kane, Toews, and Keith, they have 3 of the top 10 most marketable players in the NHL. Toews along with Keith and Seabrook, have won Olympic Gold to go with their Stanley Cup wins. 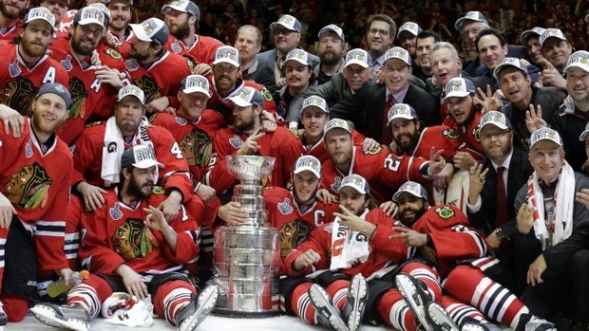 The Chicago Blackhawks are truly the definition of a modern era sports dynasty. Does WiiFi Make you Sick?